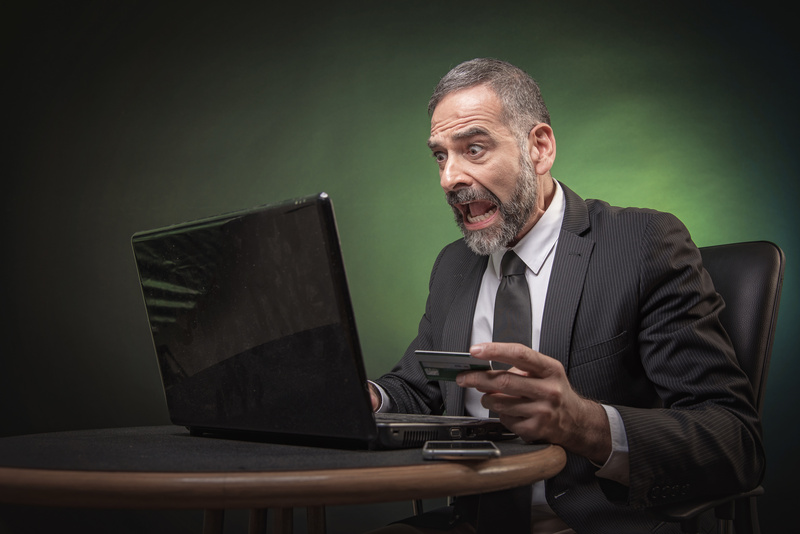 Senior businessman utterly shocked by the credit card balance he’s checking on his laptop. Super Bowl LIII — or 53 to fans of non-Roman numerals — is this Sunday and it features two teams that you could argue shouldn’t be there. This is a business blog, but let me dive quickly into football talk. The New England Patriots were driving down the field in the AFC championship game trying to tie the score in the final minutes when its star player threw an interception (he threw the ball to the other team). That should have doomed them, but a referee called a penalty on the Kansas City Chief who was not involved in the interception, nullifying the play, and the Patriots went on to win the game and, with it, a trip to the Super Bowl. In the other playoff game, the New Orleans Saints were tied with the Los Angeles Rams and were trying to drive down the field for the winning score. On a crucial third-down play, the Saints threw the ball to an open receiver. Before that guy could catch the ball, a Rams defender smashed into him, helmet first. The Rams player hit the Saints receiver in the head — which has been outlawed — well before he could try to catch the ball, which has never been legal. In this case, the referee didn’t call either penalty. Instead of having a first down and a chance to run the clock down to 1 second and kick the winning field goal, the Saints were forced kick a field goal with lots of time left in the game. The Rams got the ball back, tied the game and won in overtime. So for the past two weeks, there has been more talk about the teams that aren’t playing in the Super Bowl than the teams that are. Yet the Patriots and Rams, who will take the field this Sunday, aren’t apologizing for their hard work and, in the end, good fortune. The business lesson here is that the Saints and Rams have no need to apologize. The teams prepared game plans, practiced plays, took the field and put themselves in position to win — and got some luck along the way. If they hadn’t put themselves in position to win, those plays wouldn’t have mattered. There is a reason that people who consistently work hard and prepare seem to be luckier than those who don’t. For setting boundaries on your own time: There’s work time and there’s time to recharge and spend time with family and friends. You never have to apologize for not checking your emails at midnight or on the weekends if you’re not specifically on call to do so. Business is a marathon, not a sprint. People who are always working burn out. For taking a vacation or personal days: Workers in the United States have a terrible habit of not using their vacation time, although that may be changing in the economic expansion. Beginning in 2000, according to Projecttimeoff.com, workers in the U.S. on average used fewer vacation days than the year before for 15 straight years. Finally, in 2016, the average amount of vacation taken increased from the previous year. Still, more than half (54 percent) of U.S. employees in 2016 ended the year with unused vacation time. Getting away is good for you and the business you run or work for. It allows you to recharge and rethink. Don’t apologize for taking time off. For focusing on your work: The social butterfly in the office can be a good person to kill time with occasionally. But if you’d rather finish the task at hand so you can get home to your family or out to the gym or with friends, you don’t have to apologize for avoiding the chit-chat or gossip. Be polite and explain you have a deadlne. Don’t say your sorry for doing so. For standing up when something doesn’t sit right: Everyone has a moral and ethical code. If something happens at your company and you don’t believe it’s right, report it and don’t apologize for doing so. For working faster or harder than others: If you have a project or a part of a project and you’ve prioritized your time and finished on time or, even better, ahead of schedule, don’t delay submitting it because it may make a co-worker or partner look bad. You’ve demonstrated that you can plan your time well and execute. It’s not up to you to worry about someone else’s reputation. Things that are out of your control: This is the big lesson from Super Bowl LIII. Neither the Patriots nor the Rams could control what the referees saw or did not see. They played the game as best they could and, when it was over, they scored more points than the other teams. So they move on. It’s OK afterward to focus on specific portions of a game or process to see if they need or can be made to be more fair or better for the future, but the Patriots and Rams shouldn’t have to apologize over calls made by people who were out of their control.